Naturally, like many spaces filled with those in the entrepreneur and small business community, the room was filled with people who wanted to learn more about what I like to call the ‘business equity package’ announced by Metro-Nashville Mayor David Briley and signed into law earlier this month. To provide insight on the Equal Business Opportunity Program, including the both the ordinance and regulation change, NAWBO asked Ranstad Regional Vice President Laquita Stribling to moderate the panel. The discussion centered around the equity package, as well as how to diversify the workforce and corporate environments so that they may become more inclusive. 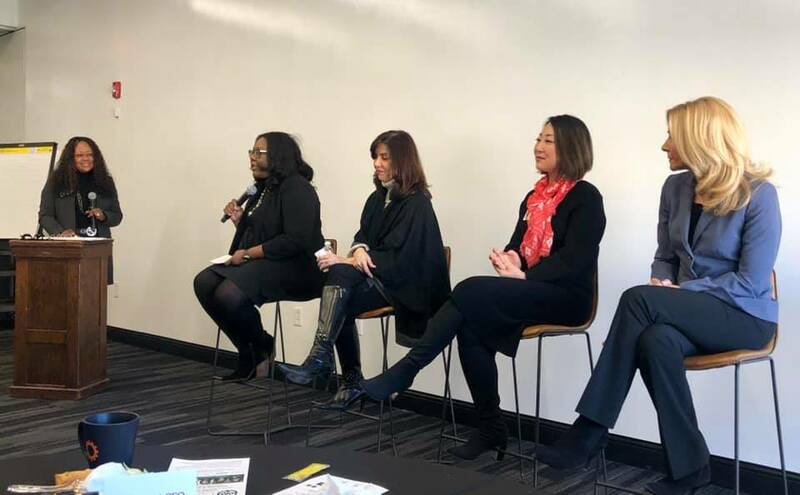 Panelists included Marcela Gomez, senior partner at the Culture Shift Team; Lucia Mar, senior vice president and market manager of commercial banking for Bank of America Merrill Lynch; Kate Herman, president and publisher of the Nashville Business Journal; and me. We had a lively conversation that touched on topics ranging from board inclusivity to diverse role modeling. After fielding some of the questions from the audience and hearing from attendees after the panel, I feel compelled to share the five most important considerations Nashvillians should evaluate when thinking about how these recent changes will affect the community, and most importantly, the economy. This Equal Business Opportunity ordinance requires Metro Nashville to move from race and gender neutral subcontracting goals to race and gender conscious subcontracting goals. This means each time the government gets ready to do business with a private firm, it must allow for certain percentages of those contracts to be awarded to small businesses owned by either a woman or an ethnic minority. The previous ‘Procurement Non-Discrimination Program’ did not stipulate such rules. Therefore, many small businesses owned by a woman or an ethnic minority were not receiving an equitable share of public work – despite being available and qualified to perform the jobs, according to the city’s most recent disparity study of public contracting awards and procurement processes. While Nashville has experienced unprecedented economic growth, many women and minority business owners have not benefit from it. This ordinance allows business owners a greater opportunity to participate in lucrative government work, which could ultimately allow those businesses to expand, increase revenue, and create jobs and wealth. This is especially important for ethnic minorities. While the area is experiencing unemployment rates as low as two percent, the unemployment rate in the black and brown communities is eight percent. Studies of contracting equity across the nation have shown that when women and minorities are given a chance to participate in government jobs at the same level as their male and white counterparts, those private firms become major contributors to the economy and create jobs – especially for those in distressed communities. If properly resourced and funded, the Equal Business Opportunity Program could be leveraged as an economic development tool to uplift underserved communities. For me, one of the most promising aspects of this program is the opportunity to correct what I see as a disparity within the disparity. A disparity study evaluates contracting data to measure the participation of available small, minority and woman-owned business enterprises within governmental agencies. Disparities exist when these firms are found to be underutilized in comparison to the proportion of available and capable firms in the region. While the 2018 disparity showed that a small percentage of all city contracts awarded to private firms from 2013 to 2017 were granted to businesses owned by women and ethnic minorities (despite several firms being available for work), not everyone experienced the disparity in the same way. When analyzing contracting data over the period evaluated by the study, it is clear that certain subgroups of business owners in specific industries are awarded public contracts more than other subgroups of business owners within the same industry. The ordinance sets specific guidelines to protect against this disparate impact. Because the race and gender conscious subcontracting goals are based on industry and availability in the market, as identified by annual benchmark reports that will provide details on the number and types of businesses available, there should be no race or ethnicity to receive a disproportional amount of contract awards. This brings me to the third fact residents should know: this measure is not affirmative action. There aren’t carte blanche numbers governmental agencies have to meet. The subcontracting goals are specifically based on data that details the number and type of firms available and ready to business with Metro. Further, the business equity package is not a social service program for women and minority business owners. Advocacy for this measure has been in the works since the early 90s. This is not a altruistic move to care for business owners. This is about equity. There are more businesses available and trying to do work than receive an opportunity. This package seeks to correct inequities. It is not about giving business owners a hand out or a hand up; this is about the equitable distribution of public resources. Lastly, in certain circles, I’ve heard the word ‘quality’ come up as a question too many times as an adjective to describe the work to be performed by these subcontracting firms. The perspective is the business owners who will benefit from the equity package have not been awarded contract opportunities because they are unqualified. Now that the measure has been signed into law, these people believe that there are scores upon scores of business owners who will now be given opportunities they are not qualified to perform. The businesses that will benefit are qualified. These businesses have already completed the necessary paperwork and processes to become registered and/or certified to do business with Metro. They demonstrate capacity by completing the often cumbersome process of finding a prime contractor with which to partner to bid on jobs and by completing the bid process itself. Further, according to the disparity study, when evaluating education, experience, skill, and other criteria the women and minority business owners had the same as their majority counterparts – the only difference was race and/or gender, thus, the reasoning for the race and gender conscious remedy. For me, what is particularly challenging about this perspective is that it assumes women and ethnic minorities are inherently inferior and unable to do the work. We do not assume this of large businesses and/or those owned by white men. If we are not willing to question the quality of the work performed by majority businesses – prior to even awarding a contract – then we should not question those small businesses owned by women and ethnic minorities. Over the next few months, I’ll be part of a team that will share with business owners and community members how this package will affect small, women, and minority-owned businesses and what steps they’ll need to complete in order to take advantage of forthcoming opportunities. We’ll already be talking at the Nashville Area Chamber of Commerce’s Area Advisory Council meetings in February and March. We’ll be working on adding other dates and community meetings to the calendar. In the meantime, if there’s a community meeting you think we should attend, send an e-mail to info at denorbrands dot com to give us the details.